Washers can prevent the eyes out of the dolls. Give your lovely doll have new eyes. hope you could understand. Color: as picture shows. Durable and practical. Color: as picture. Material: plastic. Hook and Loop. Dressmakers Dummies. 10PCS WIBBLY WOBBLY EYES MOVES AROUND. 1 x Set of Puppets Doll Plastic Eyes(10PCs Total). Suitable for many kinds of puppets,like doll,Teddy Bear,plush animals,etc. Washers can prevent the eyes out of the dolls. 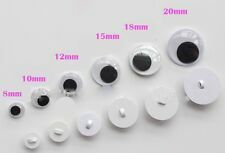 16mm Doll Making Craft Flat Eyes Acrylic Doll Accessories Eyeballs. Suitable for many kinds of puppets, like doll, Teddy Bear, plush animals, etc. SIZE: 16mm x 10 pieces. MORE SIZE AND COLOURED EYES ARE ALSO AVIALABLE. Wibbly Wobbly Googly Eyes 5000 X 10MM (1cm). 5000 stick on eyes approx. 10mm across approx. WITH SELF ADHESIVE, JUST PEEL OF & STICK ON. The eyes are white, with a black pupil that wobbles around inside. 500 Self Adhesive wiggle eyes with lashes in assorted colours and sizes 10mm, 12mm & 15mm. 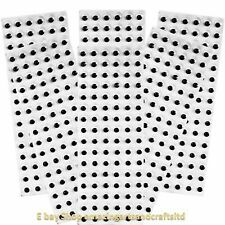 No need for glues or pastes just peel the protective backing paper off and stick to your models, Cards or other craft projects to help bring them to life, an essential craft accessory. These shrink wrap bags are 6" x 9", so a standard size CD jewel case will fit. When heat is applied, (hairdryer) the bag will shrink upto 40% of it's original size. Professional looking wrapping. Will shrink around your goods when heat is applied from hairdryer. 200PCS WIBBLY WOBBLY EYES MOVES AROUND. -For amateur DIY doll manufacture craft;. -Mainly used for toy animals eyes. -With thread end and washer buckle;. DIFFERENT SIZE EYES ARE ALSO AVIALABLE. Material：Acrylic plastic. 200 Self Adhesive wiggle eyes in assorted types, colours and sizes. sizes are 10mm, 12mm and 15mm. No need for glue just peel the protective backing off and stick them to your models, cards or other craft projects. 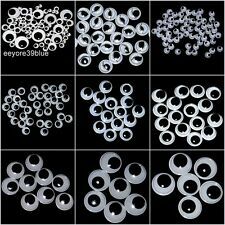 10 x 14.5mm Doll Making Craft Oval Eyes Acrylic Doll Accessories Eyeballs. Doll Eyes For Toy/Scrapbook Handmade DIY Crafts. The eyes are white, with a black pupil that wobbles around inside. MORE SIZE AND COLOURED EYES ARE ALSO AVIALABLE. 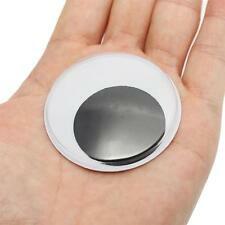 11mm Doll Making Craft Oval Eyes Acrylic Doll Accessories Eyeballs. SIZE: 11mm. Doll Eyes For Toy/Scrapbook Handmade DIY Crafts. The eyes are white, with a black pupil that wobbles around inside. MORE SIZE AND COLOURED EYES ARE ALSO AVIALABLE. 1 Sheet of 10mm Self Adhesive Googly Eyes. • Bring any object to life with our fun self-adhesive Googly eyes from Rocking Party! • Perfect for kids / arts & crafts projects. 100PCS WIBBLY WOBBLY EYES MOVES AROUND. Washers can prevent the eyes out of the dolls. Puppets Doll Plastic Eyes with Washers(100PCs Eyes). DIFFERENT SIZE EYES ARE ALSO AVIALABLE. NOT SELF ADHESIVE. Color:As Pictures. 11mm BROWN Doll Making Craft Oval Eyes Acrylic Doll Accessories Eyeballs. Doll Eyes For Toy/Scrapbook Handmade DIY Crafts. The eyes are white, with a black pupil that wobbles around inside. MORE SIZE AND COLOURED EYES ARE ALSO AVIALABLE. 1000 x 10mm Black wiggle eyes. Using a suitable child safe glue or paste, you can easily attach these brightly coloured eyes to your models. Cards or other craft projects to help bring them to life, an essential craft accessory. 4000PCS WIBBLY WOBBLY EYES MOVES AROUND. 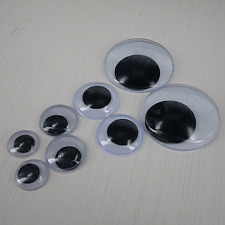 Puppets Doll Plastic Eyes with Washers(4000PCs Eyes). Washers can prevent the eyes out of the dolls. DIFFERENT SIZE EYES ARE ALSO AVIALABLE. Color:As Pictures. 100 x 12" 250 Gauge LP Polythene Record Sleeves, Strong Gauge Polythene Record Protection, Still Longlasting And Very Clear Material. 12" - 326mm x 330mm. 250 Gauge Polythene Sleeves. If there's a problem, just let us know and we will fix it. Inserzione bundle No. GSG COLOR DISTRIBUTION. You can retire in place. CUSTOM MADE, YOU CAN COLLECT YOUR MATERIAL DIRECTLY IN OUR. 1000PCS WIBBLY WOBBLY EYES MOVES AROUND. 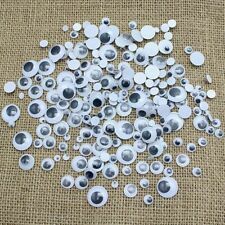 Puppets Doll Plastic Eyes with Washers(1000PCs Eyes). Washers can prevent the eyes out of the dolls. DIFFERENT SIZE EYES ARE ALSO AVIALABLE. Color:As Pictures. 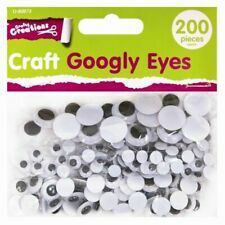 500 Wiggle Wiggly Googly Eyes Self Adhesive assorted 10mm 12mm 15mm in a reusable Craft Box. 500 Assorted size Self Adhesive wiggle eyes supplied in a reusable hinged lid, clip seal, sturdy plastic Craft box. 576 Self-adhesive wiggle eyes 10mm supplied on sheets. Each sheet has 96 eyes that can be easily peeled away from the backing sheet so there is no need for any glue. Just peel your eyes from your sheet and stick them. 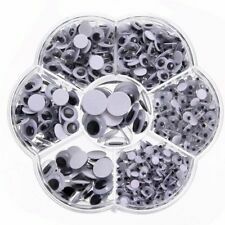 1box 5-12mm Self-adhesive Wobbly Googly Eyes DIY for Clothes Scrapbooking Stuffed Toy Doll decor. DIFFERENT SIZE GOOGLY EYES ARE ALSO AVIALABLE. Suitable for many kinds of puppets,like doll,Teddy Bear,plush animals,etc. 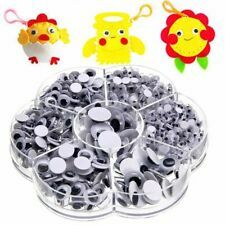 ECO-Friendly Plastic Sew on Wiggly Wobbly Googly Doll Eyes For Toy/Scrapbook Handmade DIY Crafts. Wibbly Wobbly Eyes GOOGLY EYES. SIZE: 18mm. 100PCS High quality 18mm. The eyes are white, with a black pupil that wobbles around inside. 500 Black Round wiggle eyes in assorted sizes 10mm, 12mm & 15mm. 350 coloured wooden sticks & 50 x Assorted Size Goggly Eyes . Art, Craft, cards.